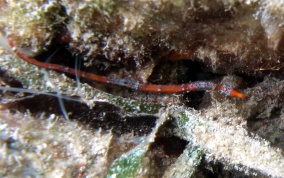 This short nosed pipefish has been observed in several bays around the island in about 2.5-3 feet of water. All were in areas of sandy rubble and algae that they used as protective cover. Shown here are 4 different color phases out of a possible nine. 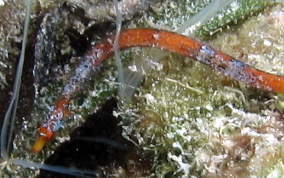 Also known as the Banded Pipefish. 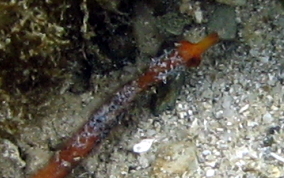 Pipefish belong the same family as seahorses and sea dragons. 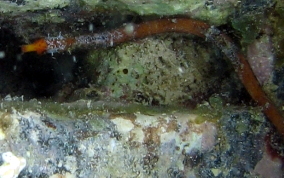 They have fused jaws and ingest their food (small crustaceans, like Mysid Shrimp) by inhaling it. They have no ventral fins. 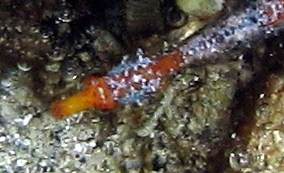 (The smallest sea horse know was discovered in 2009 and is only 11mm long.) 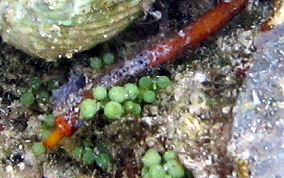 Pipefish reproduce much like the seahorse, that is, the female deposits her eggs in a pouch on the males "chest", or attaches them directly to his body and he is the one who gives birth! 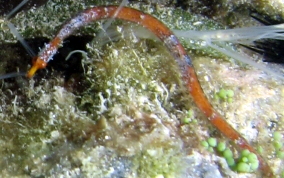 Read more about sea horses, pipefish and sea dragons ...(external link).